THIS BRAND NEW KIT CONSISTS OF. 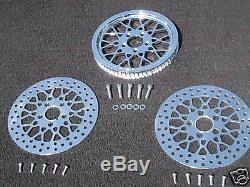 (1) FRONT POLISHED STAINLESS STEEL MESH STYLE 11.50 HARLEY ROTOR 84'-99. (1) REAR POLISHED STAINLESS STEEL MESH STYLE 11.50 HARLEY ROTOR 84'-99. (1) CHROME MESH STYLE 65 TOOTH 1 1/2 THICK ALUMINUM PULLEY FOR 84'-99. (1) 1/2 CHROME BILLET PULLEY SPACER FOR 84'-99' TO INSURE PROPER BELT ALIGNMENT. (1) SET = (5) PCS. CHROME BUTTON HEAD BOLTS FOR FRONT ROTOR 5/16"-18 X 3/4 ". CHROME BUTTON HEAD BOLTS FOR REAR ROTOR 3/8"-16 X 1". CHROME SOCKET HEAD CAP SCREWS & WASHERS FOR PULLEY 7/16"-14 X 2 ". FITMENT IS 1993'-1999' HD FLST MODELS. THE ROTORS ARE MADE FROM T-420 STAINLESS STEEL AND ARE RUST RESISTANT AND HARDENED WITH 12%-14% CHROME CONTENT. The item "MESH STYLE PULLEY KIT WithFRONT & REAR HARLEY ROTORS 65 TOOTH FOR 1 1/2 BELT" is in sale since Sunday, December 23, 2018. This item is in the category "eBay Motors\Parts & Accessories\Motorcycle Parts\Brakes & Suspension\Other Brakes & Suspension". The seller is "choppershop1" and is located in Huntington Beach, California. This item can be shipped worldwide.